Theatre is a wonderful way for kids to get comfortable performing and being on stage! Our theatre program gives students the opportunity to practice dramatic performance, both scripted and improvised, develop characters, persona, and public speaking ability, and work on stagecraft and production. Students are offered several opportunities to perform throughout the year and showcase their talent and ability. All group theatre classes run from Sept. 4, 2018 - June 14, 2019. Please click on the links below or scroll down for registration information. Curtain Up! Light the Lights! We have a show to do! Discover basic skills through theatre games, improvisation, and character development and movement. Students will develop confidence and self-esteem through ensemble building. 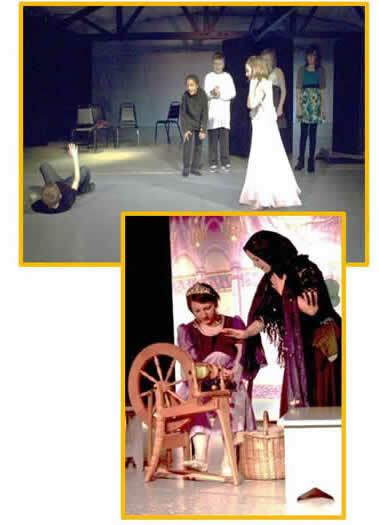 Plays are produced and performed throughout the school year. Tuition listed below reflects the equal payment option. Curtain Up! Light the Lights! We have a show to do! Discover basic skills through theatre games, improvisation, playwriting, character development and movement, as we create a performance piece that will be presented in our theatre. Students will develop confidence and self-esteem through ensemble building. The kids become actors, directors, tech crew, and producers in this creative process. Three plays are produced and performed throughout the school year. Tuition listed below reflects the equal payment option. Become a pro with set, lights, make-up, sound, and costume design. Develop the skills in class and use them to crew upcoming PMA productions. This 3-week discovery class allows for intensive individual attention with lots of one-on-one instruction. Contact our office if you are interested in this program.